The medieval stone bridge at Maidstone, adjacent to the Archbishop’s Palace, was probably built in the 14th century by one of the archbishops of Canterbury. Over the centuries the bridge was altered from its original nine pointed arches to five rounded arches and the roadway was widened, but by the mid-19th century the old bridge had gradually deteriorated to an unsafe state. 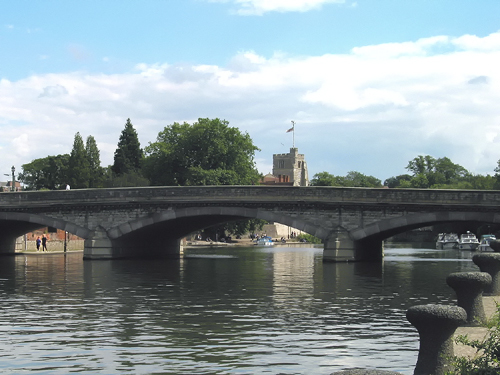 In 1879, the Maidstone Bridge was rebuilt by the distinguished Victorian engineer Sir Joseph Bazalgette, CB, who had also built the Thames Embankment and the London sewers. The Rochester Bridge Trust contributed £20,000 toward the £48,000 cost of rebuilding the bridge in 1879 and a further £17,000 toward the cost of widening the bridge between 1926 and 1936. Because the Wardens and Assistants required their Bridge Engineer to approve Bazalgette’s design, the Rochester Bridge Trust still has in its archives a copy of the plans for the Victorian Maidstone Bridge.